If you haven't heard of Pintrest. You should check it out. It's pictures and pictures of things that you can "pin" onto your boards. It's so many different pictures that are ideas to cook, make, decorate for the holidays, design your home, dress yourself or your kids, wedding ideas, and even funny things that Susan especially likes to pin. Of course my "Food I want to make" board has the post pins. But seriously check it out. Its like everything women like all in one little world and it can entertain you for hours on end. And that is where I found this recipe. Originally from the new show on ABC The Chew. (Which I'd love to get to watch but I have a thing that gets in the way of me watching day time television. It's called a job.) 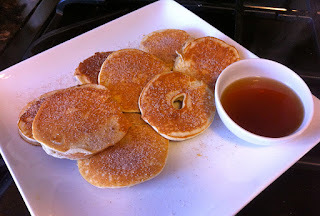 This recipe is perfect for a Sunday morning breakfast before Fall is over. First add the apple cider, a little lemon juice, and some cinnamon to a pot. Bring to a boil to until it is reduced to a syrup consistency. I of course did not do this I ended up only heating the cider up because I didn't want to wait forever for it to thicken. Mix eggs, mix, and milk together until smooth. Then sprinkle in some cinnamon. Spray Pan or Griddle with cooking spray. Core and cut apples to about 1/8 inch slices. 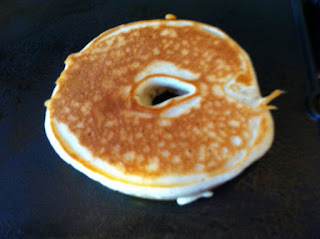 Dip slices into pancake batter. Cook on high and flip until both sides are golden brown. Serve with hot "syrup".